There are advent calendars and then there are advent calendars. Drinks by the Dram recently released its 2018 lineup of advent calendars for booze enthusiasts. There are gin, tequila, rum, and whisky options…and then there’s the “Very Old and Rare” option. 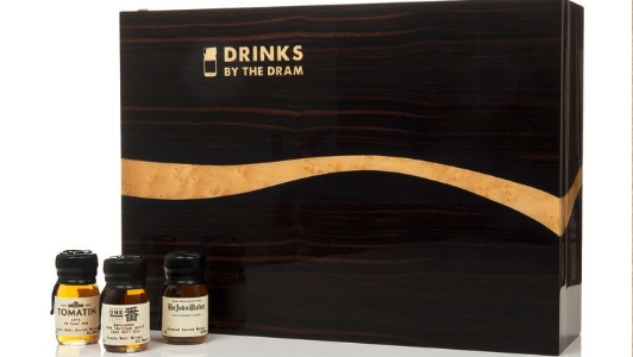 Priced at £9,999.95 (around $13k) the box contains “24 of the most spectacular whiskies ever created” and it should with a price tag like that. Bottles include sips of expressions that go for over £19,000 a bottle as well as 60-year-old scotch whisky, and some super rare Japanese selections. Each dram comes in a handmade 30ml wax-sealed bottle, all enclosed in a wooden box handmade by cabinet-maker Simon Jewell. For your wooden box, you can select between a Walnut-finished box or a Macassar ebony finish. The box can be purchased from Master of Malt or Muazo, both of which ship internationally.